Cash coin and gold are a traditional New Year’s dinner in this home. 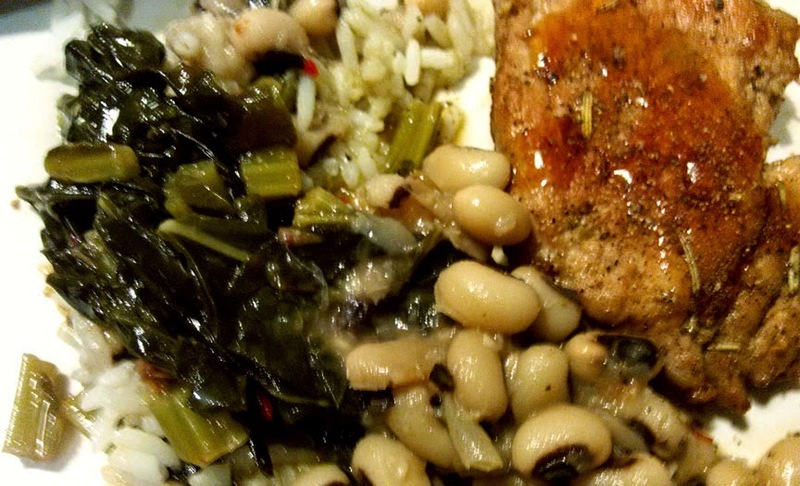 In our Southern United States we celebrate the New Year with cash, coin and gold—long-braised collards, stewed black eyed peas (hoppin' John) and pork chop medallions. My friend’s mother (Mississippi born Mama Jean Hogan), taught me how to make collards. Home-made stock, smocked hocks, a pinch of baking soda, pepper vinegar and a lot of patience. I saved the bones and vegetable scraps to make rich stock for the collards. But I added a few things to the menu this year: kimchee roasted Brussels sprouts and turnips and kimchee collards. New Year’s forecast: 21015 will be spicy, rich and delicious.